This red spruce root (Picea rubens) has compartmentalized the Armillaria infection, but space for storage has been greatly decreased. Note the fungus wedge in the bark. How do root rots kill trees? Do they? Are the "killer fungi" the primary cause? What is meant by predisposition? Who is Sorauer, and why do we need to know something about his work? It is time to take a closer look at root rots, and especially those caused by species of Armillaria. I say species of Armillaria because we know that more species than Armillaria mellea are involved. The subject of armillaria root rot has been discussed many times. I will try to give some information that is not usually reported. First, as with any problem, it is important to understand the background information and some history . That is why I plan to include predisposition and the father of the subject, Paul Sorauer, in this brief discussion. Decay associated with a species of Armillaria in the roots of this American beech was compartmentalized as it spread into the tree base. The year 1874 is a good time to start. This is the year that Robert Hartig published his famous book on important diseases of forest trees. The first subject in this book is armillaria root rot. Hartig called the fungus Agaricus (Armillaria) melleus. Hartig took the disease concepts of Anton De Bary and Gotthelf Kuhn and applied them to trees. This was a monumental moment for all trees. Hartig proved that the fungus fruiting on a wound was the same as the fungus causing the rot behind the wound. The single fungus, single disease concept was accepted and began to move quickly. One reason was that problems of decay in living trees and wood products were considered very economically important. Decay associated with a species of Armillaria was weakly compartmentalized in the base of this Populus tremuloides (arrows in the wood). The red arrow shows the barrier zone and the arrow at left shows the fungus wedge that spread into the bark. Also in 1874, another book was written. It was a handbook for plant diseases by a person history seems to have forgotten, or left behind, Paul Sorauer. More than half of his book was on abiotic causes of diseases and predisposition. Although his book was reprinted six times prior to 1934, his concepts on predisposition just were not able to compete with the concepts of a single pathogen for a single disease, including decay in trees and wood products. The strange part of this story is that arguments went on for decades about whether decay in trees could even be considered a disease. Why? Because decay was said to be the breakdown of dead heartwood. How could you have a disease of dead matter? The heartrot concept that followed was really a decomposition concept. The response of the living tree to the wounds and the infections was not considered. Also, isolations for fungi were done on malt agar alone, which does not support growth of bacteria and non-decay causing fungi. Consequently, associated microorganisms were not detected frequently. Over the years, the concepts of Paul Sorauer have made more sense to me. A major reason why his work is so difficult to understand and accept is because it is difficult to remember the many seemingly unimportant events and agents that accumulate over time and predispose a host to pathogens that could kill or cause decay. It is easy to see and touch the decayed wood, the large sporophores and the declining tree. 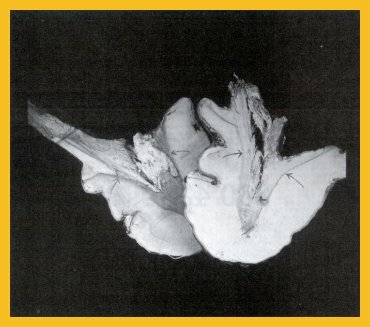 If the sporophores are obvious when the tree is declining, the fungus inside the tree that relates to the sporophores must be the cause. This story repeats and repeats. 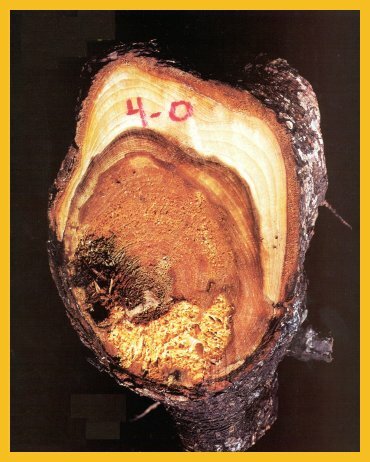 This point is well-taken with armillaria root rot, How could anyone say that a declining tree that has many mush- rooms at the base is not dying because of the fungus infection? The mushrooms of Armillaria species do indicate without a doubt that the fungus on the inside is the same as the fungus of the fruiting bodies on the outside. Hartig proved this. We hear it said many times over and over that Armillaria is a tree killer or the armillaria root rot killed my tree! At this point, I'm sure Sorauer is turning over again, as a pinwheel, in his grave. White spreading "fans" of mycelium from an Armillaria infection are shown at the base of this white birch. As tree defense decreases from root infections, the pathogen often grows rapidly into the bark. Why are root rots called killers? Have you ever wondered why there are so many fungi known to cause decays in trunks of trees, yet few are cited as the cause of decline and death? The answer usually given is that the rots are compartmentalized. Don't roots compartmentalize infections also? Of course they do! And, they usually do it more effectively than trunks. So, why is it said so often that root-rotting fungi, such as Armillaria species, kill trees? A major problem is that trunk wood and root wood is thought to be similar. When you start with a false premise, confusion or myth will always follow. Root wood is different from trunk wood in many ways. Trunk wood and root wood both store starch in living cells, but root wood has a much greater percentage of living cells than trunk wood. 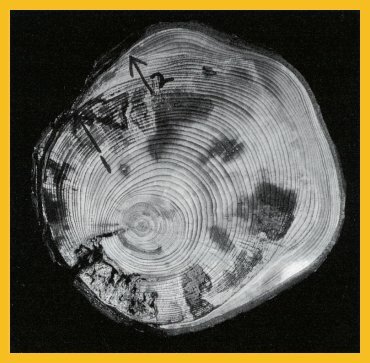 When I2- KI is poured over the cut surfaces of trunk wood and root wood of the same tree, the root wood will be much darker in color, indicating more starch in more living cells. Starch is not soluble in water. However, when water molecules are chemically "inserted" back into starch by way of amylase enzymes, the starch is converted back to glucose. Glucose is the fuel for life. Glucose also "runs" the defense system. When glucose reserves are high, defense is high. When glucose reserves are low, defense is low. When defense is high, we say the organism is healthy. Most pathogens are opportunists and wait until defense is low before they attack. Before I continue with this subject, I should give some other characteristics of root wood. Roots also mechanically support the tree. Root wood does have lignin, but not as much as trunk wood. This is best shown when you cut trunk wood and root wood of the same tree and feel the difference. It is much easier to cut root wood than trunk wood. Roots transport liquids that contain essential elements for tree life. The diameters of root wood vessels, or tracheids, are usually larger than those in trunk wood. "Agree or not, all living things will obey natural laws of energy and matter. The laws state that no organism or system will remain orderly (healthy) unless there is a continuous supply of energy, and that energy and matter cannot be destroyed but only converted to other forms. " Great numbers of living parenchyma cells usually surround root wood vessels. The living cells in root wood also "make" many substances essential for tree life. Roots do not have a pith. Roots do not have a green cortex. Roots do not "make" their own energy. Roots do not have heartwood. Space for storage of energy reserves is of top priority. Species of Armillaria have a unique ability to rot wood and form wedges into the root bark. In a sense, Armillaria species are root canker rots because this is also an ability of canker rots of trunks. 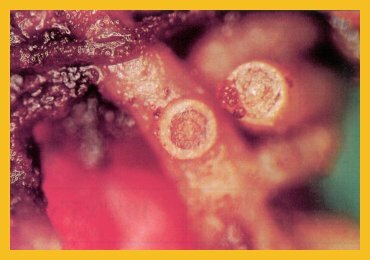 And, the fungi that incite trunk canker rots usually infect branch stubs that have weak protection zones. Protection zones at the base of the trunk branches or root branches depend on energy reserves for protection substances. The story repeats as energy reserves decrease, protection zones become weaker and finally lose their ability to resist invasion by the pathogens. Canker rots are caused by fungi that can rot wood and form wedges into the bark. When conditions are best for rotting wood, they rot wood. When conditions are not best for rotting wood, the pathogens form large wedges into the bark. As the bark wedges increase in size, they squeeze and eventually kill the cambium from the bark side inward. Then the defenseless wood beneath the bark is easily invaded by the pathogens. In time, the expanded volume of infected wood is compartmentalized. As this host-pathogen "seesaw" continues, the host can "win" if compartmentalization is fast and effective, and enough new wood is formed to store more energy reserves. The host begins to "lose" when the pathogens begin to occupy more and more space. 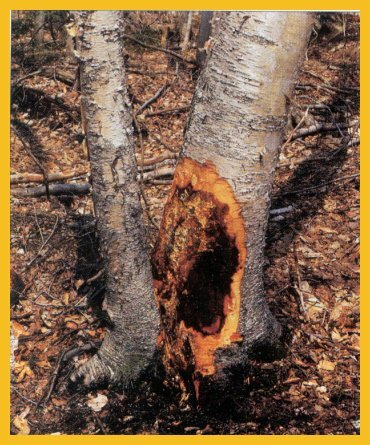 Perennial trunk cankers have a similar ability to grow slightly in wood and rapidly in bark. 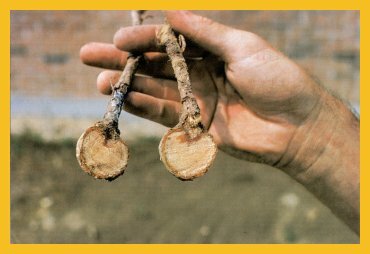 The difference is that the fungi that incite perennial trunk cankers are not able to grow rapidly in wood and cause decay. Arrow 1 in this spruce root (Picea rubens) shows the position of an Armillaria bark wedge that formed several years before the second wedge formed, as shown by arrow 2. Time for Paul Sorauer to enter again. How does his predisposition concept fit into this story? First, think about where problems blamed on species of Armillaria are most serious. I think you will agree that in urban areas it will be in places where intensive work is done to provide beautiful landscapes. In forests, it will be where the trees are heavily cut - as in clear cuts, plantation thinning or intensive selection-repeated at short time intervals. There must have been a reason why Robert Hartig spent 30 years studying Armillaria spp. And why it was the first subject in his first book. The forestry management methods in that part of the world favor conditions that invite species of Armillaria and other root-rotting fungi. In forests, Armillaria spp. also follow defoliations, such as those caused by gypsy moth caterpillars, and diseases such as beech bark disease and oak wilt. Also, mushrooms of Armillaria species are common on stumps. 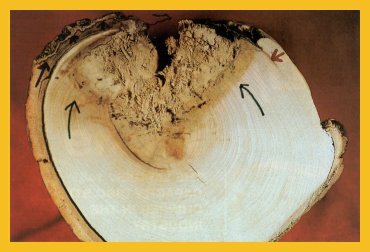 Removal of the top does not mean that the woody roots die immediately. As the energy reserves in the roots decrease, the point is reached when defense systems no longer function. The "clean-up crews" enter. Tree removals in urban areas, even when the stumps are ground down, still provide root wood for opportunistic pathogens. As populations of the pathogens build up, they may attack trees that have stronger defense systems. What Sorauer said was that when conditions or other agents cause defense to decrease, predisposition starts. The hosts become easier to attack or the host is predisposed to attack. Agree or not, all living things will obey natural laws of energy and matter. The laws state that no organism or system will remain orderly (healthy) unless there is a continuous supply of energy, and that energy and matter cannot be destroyed but only converted to other forms. The law of conservation of matter "clicks" in when the energy flow of any system becomes inefficient. The energy still remaining in the system - the tree and especially the roots-will not be wasted. This is what I mean when I say that the "clean-up crew" enters. Some other organisms will "come in" to use the remaining energy in more efficient ways. The wood is made up mostly of cellulose, hemicellulose and lignin. All of these substances have a carbon, hydrogen and oxygen framework and can be utilized by microorganisms as an energy source for their metabolisms. Animals do not have the enzymes to make the chemical conversions. Many microorganisms do. The energy in the remaining starch and wood is then used further. Think what would happen if these natural laws were not operating? We would have no breakdown of once-living organisms. You can think of life as a journey, powered by the sun, of a highly ordered group of chemicals, borrowed from the soil. Death is the end of the journey when chemicals and their energy are returned to the soil to be used again for new life. Everything is recycled. No waste! As Armillaria infections and infections associated with other root-rotting fungi spread into larger roots, the infections are compartmentalized, but storage space is decreased to the point where defense processes no longer function. Then, the pathogens grow rapidly in the host. How do the pathogens get into the roots? Species of Armillaria are ubiquitous in soil. The black shoestrings, or rhizomorphs, can easily be found growing around many living, healthy roots. The fungi in this genus have been found throughout extremely large land areas. My point is that they seem to be everywhere, just waiting for the right conditions to attack. If they are everywhere, why do they not kill all trees? Just as the sun and the cold are triggers for other problems, so it is with Armillaria species. The gun must be loaded or in a state where the trigger, once pulled, will set it off. Again, low defense is the condition for infection. But where do they get in? Roots have many branch roots, just as trunks have many branches. As described briefly above, there is a protection zone at the base of branch roots just as in trunk branches. When energy reserves are low, the protection zones are weak. Roots in forests where no human activities have gone on for many years still have many wounds. As roots squeeze against each other, dead spots and cracks may form. As roots squeeze against rocks, the same type of wounds may occur. Then there are insect wounds and wounds caused by small animals. My point is that the pathogens do not have to "look hard" to find openings into the roots. The rhizomorphs always seem to be there. As wounds are inflicted and as branch root protection zones weaken, the pathogens attack. In areas where soils receive high amounts of water, another type of wound or opening can occur. When water is abundant, the suberin protection at the base of mycorrhizae may not form. With leaves, the leaf starts to die and then the basal abscission zone forms. With mycorrhizae, the mycorrhizal organ dies after the abscission zone forms. When the zone does not form, it serves as the perfect infection court for microorganisms, such as those in the genus Phytophthora. The dead spots could also be opening for other organisms. The broken mycorrhiza shows the basal attachment that could be an infection court for other root pathogens in the soil. Under ideal conditions, an abscision zone forms first at the base and then the mycorrhiza dies. Now comes the hard part! What can be done to reduce injuries by root-infecting organisms? A major actor in this story has not been discussed-humans. I believe that humans and their activities are major causes of root rots, by way of predisposition. When trees, knowingly or unknowingly, are over-watered (to support weed-free green grass), over-injected (because you can kill everything, good guys and bad guys and no need for diagnoses), over-mulched (so what can we do with all these chips? ), planted too deeply (we have always done it that way), over- braced (it won't fall over, even in a high wind), over-amended (maybe if we throw more stuff on, all will be better), it is a wonder trees grow in our urban areas. And the assaults go on and on. What must be done to slow the pace of "overs" is to learn some simple tree basics. Ignorance of tree biology has been, and still is, the major problem of trees worldwide. That goes for urban trees and forest trees. ¤ For all tree managers, or for people who aim to cultivate trees in urban or forest areas, the ten most common trees they deal with should be identified. Of all the trees a person looks after, usually 90 percent will be ten or fewer species. Then list-write-at least 20 features about the tree. When there are removals or logging, take a few minutes to examine the insides of the trees. Start a sample collection. The more you learn about your trees, the better and faster will be your decisions to have treatments that promote health. ¤ If roots must be cut for any reason, make cuts with sharp instruments. No need to paint. ¤ When transplanting trees, always remove broken and crushed roots. ¤ When storms bend trees to the point where some roots are splintered, it is best to sever the root at the tree side of the splintered area. Care must be taken that the injured root or the severed roots do not make the tree a high risk for failure. In 1960, I started studies on root rots. Roots of many red pine, Pinus resinosa, in plantations were dug out and dissected to study Fomes annosus, now called Heterobasidion annosum. Later studies were done on what was called Armillaria mellea on red spruce, Picea rubens, and beech, Fagus grandifolia. Many of the beech trees were in decline from beech bark disease. Hundreds of trees were dug out and dissected. Thousands of isolations were taken from selected specimens. The published results showed that the infections "followed" the CODIT patterns, and that many other microorganisms - bacteria and non-decay causing fungi-were involved in the diseases. I also believe from research done years ago that spores of Armillaria spp. from mushrooms pass through insects, usually fungus gnats, before they germinate. “An author, lecturer and consultant, Dr. Shigo started Shigo and Trees, Associates twenty years ago after retirement from the U.S. Forest Service." The article was published in Volume XI, Number 11-November 2000 of TCI.